When I was leafing through ¡Cuba! – Recipes and stories from the Cuban Kitchen, I was reminded how much I like black bean soup. 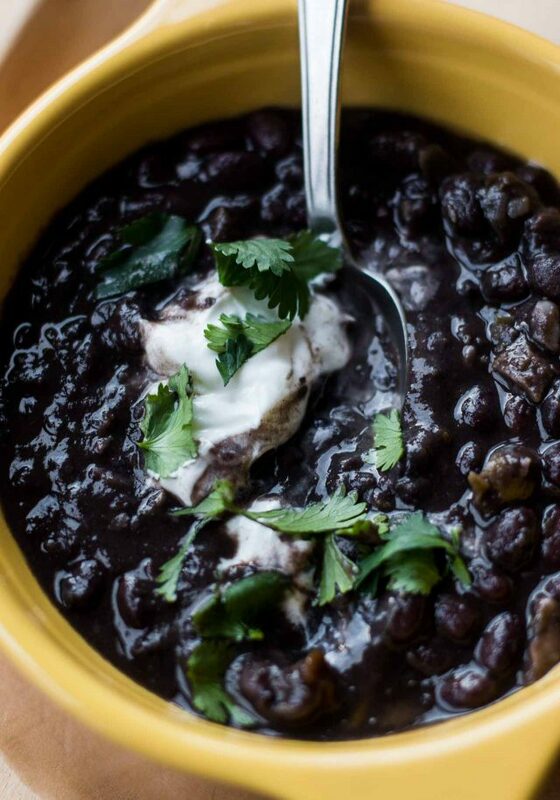 In theory, black bean soup is just a dark bowl of beans and doesn’t sound all that exciting. Which is probably why I hadn’t made it in a while. Also black beans aren’t that easy to come by in France. There are lots of wonderful beans in France – haricots Tarbais, flageolets, and haricots de Soissons, but the cultures (and cuisines) that use black beans don’t necessarily skew with French cuisine, hence their paucity. 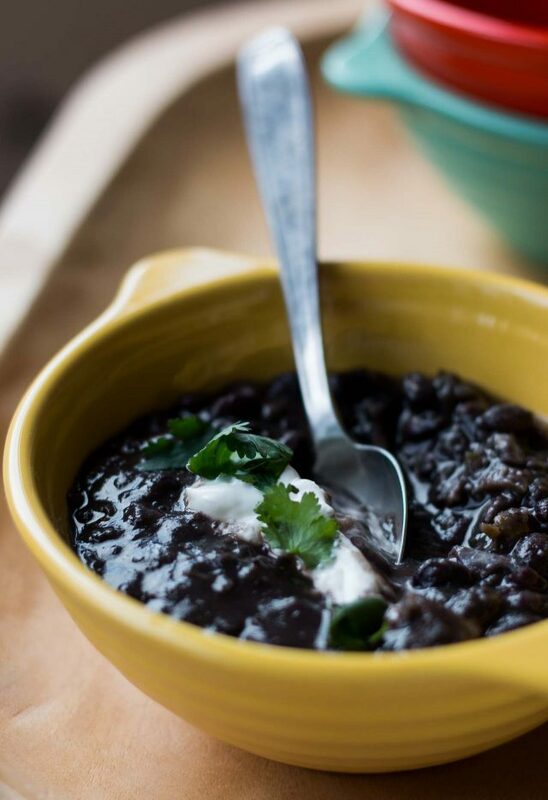 Black beans have a particularly rich flavor, much more so than others beans, and lend themselves to being paired with ingredients that have a lot of pizzazz, like peppers, tomatoes, cilantro, and tangy sour cream. You have to dig a little deeply to find them, so I was grateful when I was on book tour and someone handed me a bag of Rancho Gordo black beans. (Thanks to the woman who gifted them to me!) When I got home, I couldn’t wait to use them. 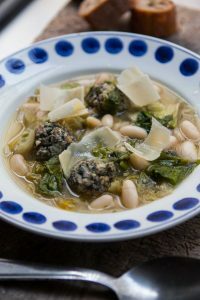 I’d been looking for a reason to revisit this soup, that’s a favorite of mine, and here it was – or is. The first time I had black bean soup was when I was working in a vegetarian restaurant. It was really, really good – excellent, in fact, and had chopped green olives in it. The story goes that a Cuban woman was dining in the restaurant, tasted the black bean soup, paused, then told the cooks that the soup would be better with olives. So they became part of the recipe. It wouldn’t occur to me to put olives in black bean soup, but works like a dream. The bits of olive gives a salty spark to the inky beans, and I love the combination. One thing I don’t love, though, is green peppers. But the flavor is important for the soup, so I took one (but not two) for the team, and used one green and one orange bell pepper, to split the difference. 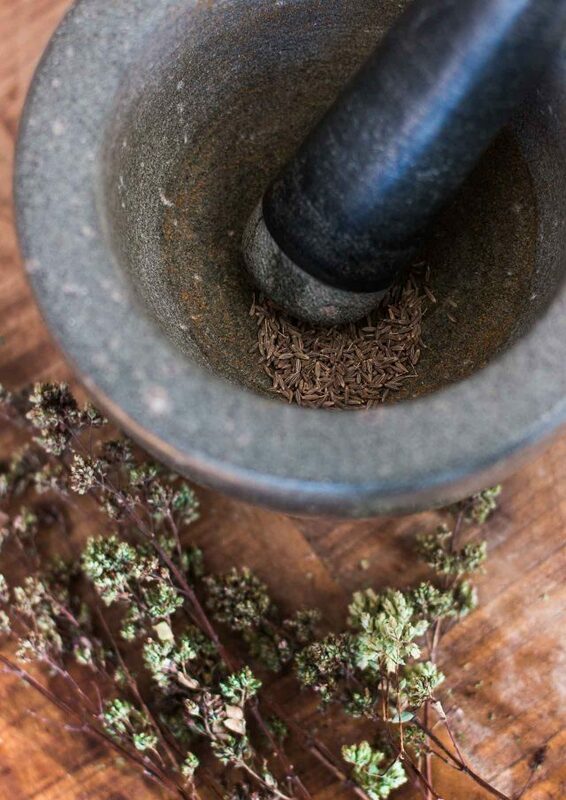 DIYers will be happy to hear that I ground cumin seeds that I picked from a friend’s garden in the south of France, and that I plucked oregano from dried branches another pal had sent me. Gosh, with friends that give me beans, spices and herbs, I just need to find someone that grows and cures their own olives, and I’ll be all set. 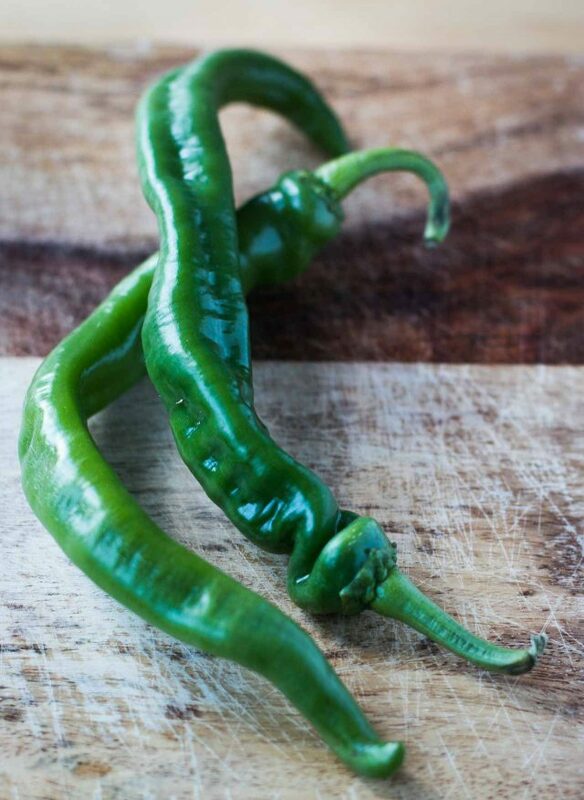 Some people don’t think that chile peppers skew French cuisine, and that’s not necessarily true. There are the wonderful Espelette peppers in the Basque region, which I’ve seen fresh in the southwest of France, but they’re usually available dried or powdered. If anyone sees them fresh in Paris, let me know and I’ll be right over! Wandering around multicultural neighborhoods, which I frequently do, in areas like Belleville and La Chapelle, I come across fresh chiles that are squat and wrinkled, and fiery hot (the vendors always try to dissuade me from buying those), or elongated, twisted varieties that are usually labeled either doux or fort – soft or strong. Their idea of ‘strong’ is often different than mine, but a middle-range chile is good for this soup. You want a bit of heat, but you don’t want to overwhelm the flavor of the beans. Of course, you can take it in any direction that you want. Either way, a dollop of cream is always welcome, and encouraged. Adapted from ¡Cuba! and Cabbagetown Café CookbookYou can either pit your own green olives, or if you want to use Spanish-style or Manzanilla green olives, as they are sometimes called (the kind sold in jars, stuffed with pimentos), no need to remove the pimentos - just chop them up with the olives, and add them.Jalapeno peppers are a good choice for the chiles, but feel free to use any that suit your tastes. I would avoid peppers that are too strong or hot, as they'll overwhelm the soup. 2. The next day, add the halved pepper and halved onion to the bean pot. Bring the beans to a boil, lower the temperature to a simmer, and cook the beans partially covered, skimming off and discarding any scum, until the beans are tender, about 1 hour, adding 1 teaspoon of salt midway during cooking. 3. While the beans are cooking, heat the olive oil in a skillet. Add the diced pepper and onion, and cook until wilted, seasoning with 1 teaspoon of salt and a few turns of freshly ground black pepper, about 5 minutes. (You may need to add a bit more olive oil if the mixture is too dry or is burning.) Add the garlic and chile peppers, and cook for 1 to 2 minutes more, then add the cumin and oregano, and cook for another minute, until aromatic. Turn off heat and add a small splash of water, scraping the bottom of the pan to release any stuck on bits. Set aside. 4. When the beans are cooked, remove the halved onion and pepper from the bean pot, as well as the bay leaves. (Discard the bay leaves.) Puree the onion and pepper halves in a blender or food processor (or with a potato masher) along with about 2 cups (320g) of the beans and enough of their liquid so they'll puree, if using a machine. 5. Return the pureed vegetables and beans back to the pot and add the red wine vinegar, chopped olives and cooked vegetables. Bring the mixture to a boil, reduce the heat to a simmer, and cook about 15 to 20 minutes more, seasoning with additional salt, if desired. Serving: Serve with a dollop of crema or sour cream. A nice touch is to add fresh lime juice to the cream, to taste. Garnishes could include chopped cilantro, crumbled cotija cheese (in place of the sour cream), diced avocado, and/or pickled onions. Storage: The soup is good the same days it's made, but some prefer it the second day, which it thickens up. The soup can be refrigerated for 3-4 days. It'll thicken up quite a bit, but can be thinned out with water or stock. Hi David! 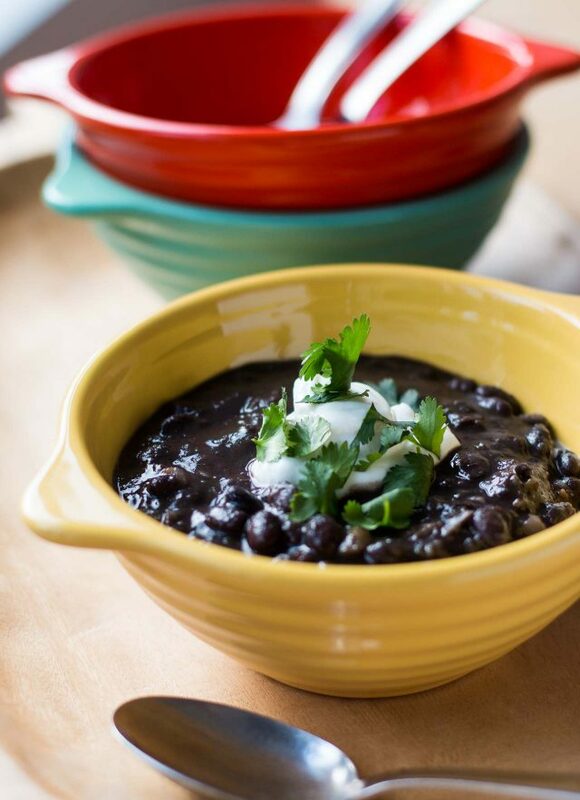 Thank you for the recipe :) my husband is from Honduras and he has been craving black bean soup so much lately. I might try to make some variation of this soup, as he tells me that his family add green plantains and chicharrón and/or “rabito de cerdo” to the soup. Do you think they would go well with the flavor profile of your recipe? I think it might, minus the green olives? I’d love to hear your thoughts. Greetings from Panama! Thanks! Sounds like something your husband might know better than I, but if I was to use those (they both sound delicious), I would put them on top, not add them into the soup. But he may have more insight on that. Would be interested in knowing more! Oh, yum. I find black beans in the bio shops, but not always. Am I missing a step? What does one do with the sauteed diced onion and peppers after setting aside? Do you think this would freeze well in single serving portions? This is going on my cooking list!! I grew up in Brazil, so beans in all forms are in my blood. Adding olives seem like an inspired choice. I will definitely try adding them the next time I make black bean soup. One of the tricks I learned in Brazil was to add Tabasco sauce to the beans. The vinegar gives it a nice flavor. I’ve been making my beans in my InstantPot – no need to soak overnight, just pop them in the pot with water and cook them on the “bean” setting. Super easy. Thanks for the new recipe! I always love your food. Rancho Gordo has a chart (on line) to give approximate Instant Pot cooking times for all their bean varieties. With soup recipes you can often mix all ingredients with the dried beans, up the liquid and process one time. I think it helps permeate the beans with the other ingredients. The IP is an interesting toy when time is at a premium, but I’ve found traditional methods tend to be better (agreeing with WaPo) – on the textural front especial. I think it’s just trial and error with the Instant Pot. I like mine, but the beans are coming out overdone or underdone–I haven’t found the perfect time yet. The range of times really varies between recipes that you see online, and even the Instant Pot charts themselves have a variation of 5 minutes. That’s a big difference! Someone needs to come up with a chart that tells how long to cook the beans for different purposes, and that would be more reliable. It would depend on which black beans you’re using but I find the longer the cook on *Black Turtle beans, the creamer tasting the bean gets, without getting mushy. *2hrs is my cook time with these. I’m always concerned about the timing of beans in a pressure cooker too. I cook mine in the microwave – takes a little more time than the pressure cooker, but it’s a lot less hassle than boiling. Love the recipe. I always slightly undercook the beans under pressure in the instapot and then cook them another 15 to 30 minutes on just sauté to until perfect. I can’t wait to try the olives. Thanks for the recipe. I live at about 5,000 feet above sea level and soaking beans at altitude is not optional. It is a must. :) I find people cooking at altitude who get frustrated because their beans never get soft, and this is often why. I’ve also started ‘salt soaking’ them by adding 1-2 Tbsp kosher salt to the soaking water according to directions from the American Test Kitchen and it has made a huge difference. Mel, I live at nearly 8000 feet above sea level and never soak beans. IMHO the main reason is the beans: the beans one buys in plastic bags in supermarkets are often old harvest–as much as five years old–and truly don’t want to soften properly. If you can find them from a bulk vendor, you probably won’t have to continue to soak them. Or as David suggests, buy them from Rancho Gordo. His are always fresh and cook beautifully. Have you ever cooked your beans in a clay pot? I still do; the clay adds a wonderful hint of earthy flavor. The lid ajar lets their heavenly aroma drift through my home to tempt me! What about adding a bit of baking soda? Does that soften hard beans? What kind of olives do you suggest? Described in the paragraph above the list of ingredients. It just reads-“chopped pitted olives”. Green, black?? I am sorry if I missed it. An excellent vegan recipe for a dish I personally would never make without some kind of ham-hock or smoky pork product. A little Spanish smoked paprika mimics the smoked ham flavor in a pinch. I have a recipe from Caprial Pence that has you stir in one ounce of dark chocolate (I usually add two!) when it’s done cooking. It rounds out the flavor nicely and brings in in a molé direction. The year we lived in Paris (2016) I looked all over the place for black beans. Finally found them in a small shop in the 1st on Rue St-Honoré, across from l’Oratoire du Louvre. They had other Latin American ingredients and bulk beans/nuts/ dried fruit. Things change fast in Paris so who knows if those guys are still there, but it was a friendly shop. David, do you think steps 1 and 2 could be combined into one step and this soup could be all made in one day if i put the dried beans, bay leaf, onion, and green pepper in a pressure cooker and cooked the beans? or would the pressure cooker overcook the onion and green pepper? Love black bean soup and can’t wait to try the olives. I always add a bit of white wine, too. And cooking your dried beans is so much better than canned but Trader Joe has great canned organic in a pinch. While I don’t remember if they stock dried beans, I find black beans in a tin in Portuguese shops here outside of Lyon. It looks like your earthenware cocotte is Portuguese or it resembles the ones I see in the Portuguese shops. It’s Bauer Pottery made in California. Hi David. Do you drain/rinse the beans after soaking or just cook in the soaking liquid? I cooked TONS (almost literally) of black beans when I lived in Costa Rica in many variations and with many combination of seasonings. The addition of olives is interesting. One I will try. The Costarricense eat them three times a day and with everything. Bill and Alison: Yes, I do find black beans in certain shops but almost always they’re rather old so they take a really (really) long time to cook. I’ve had some that don’t cook at all, so I don’t buy them unless they’re from a place that turns over their stock frequently. Franko: I’ve not have any experience with a pressure cooker but I linked to an article above in the Washington Post where they cooked black bean soup in both a Dutch oven and IP, and compared the results (spoiler: the Dutch oven won), but they give tips on using the IP. Christine: No, I cook the beans in the soaking liquid. Steve Sando, the bean expert from Rancho Gordo, says no need to change the water. Some of the reasoning is that you’re discarding some of the flavors. S.: Love your books and recipes! If this is as good as your Split Pea Soup, then it’s a winner. I looked literally for years for a split pea soup I could make my own, and yours was it. I’ll be making this later in the week. THANKS. Should the soaking water be discarded? David, fresh piment d’Espelette can be found in september only at open-air markets or “chez le maraîcher”. I can see these chilies at my “Cartalade primeur” in Montreuil every year. They are sold in order to be home-dried. You can also find black beans at organig stores or ethnic-food stores. I have recipe for black bean soup where you stir 1/4 cup of dark rum into the soup before serving it. 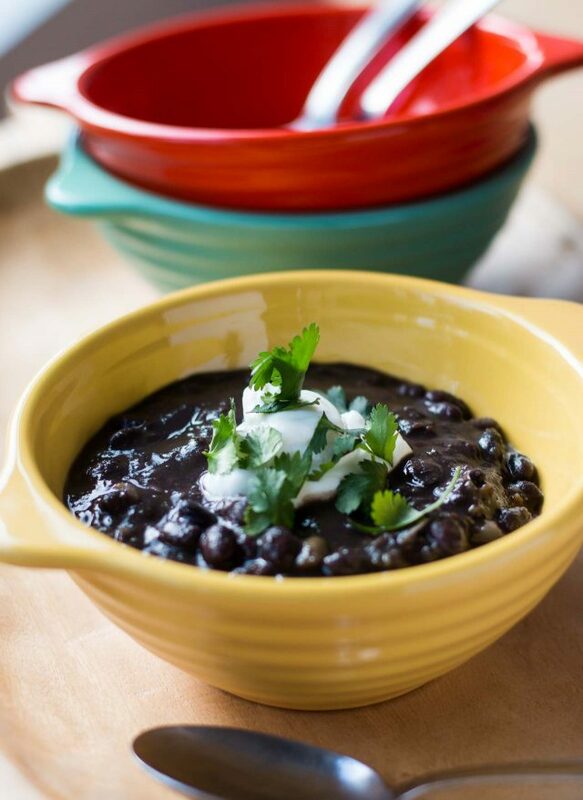 I never make black bean soup without it now – it really adds a depth of flavor that I love. I definitely will try this vegetarian version though; sounds intriguing with the olives! those trying to copy that amazing Panera black bean soup. I’m willing to give this a try and am a bit lazier as far as soaking the beans goes. I’d just as easily open a couple of cans. I’m sure other readers are agreeing and others aren’t. 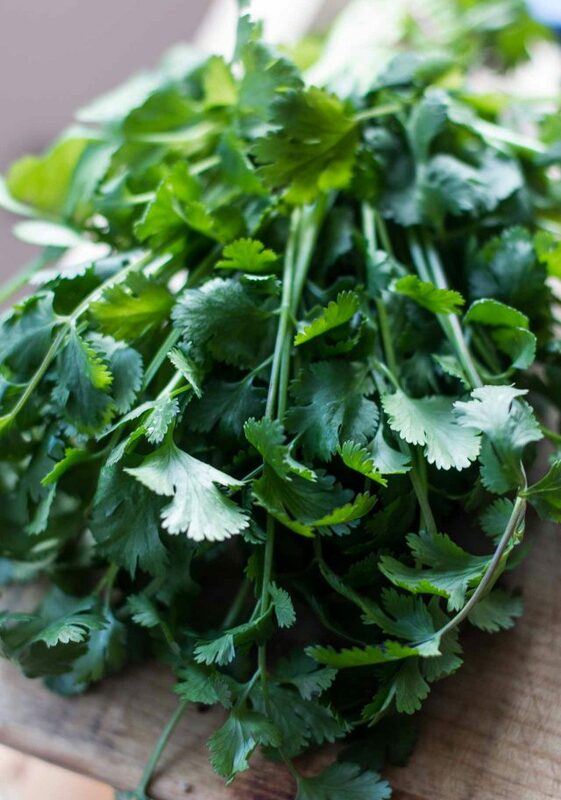 I just started up my Aerogarden indoors growing some herbs, so they will help with the cilantro ( italian parsley). I don’t like green peppers either. Odd taste. But then I was watching Jacques Pepin and he peels his green peppers. Just green ones.Takes the outer skin layer off. And the peppers are great. Maybe some will say that is the flavor addition you’re peeling off but if it’s good enough for Mr. Pepin it’s good enough for me. Hey David. This sounds delicious. I’m a big fan of black beans and my recipe is pretty similar except for cooking the beans with 1/2 of a pepper and onion whole along with the green olives. I’m trying this out. Probably this weekend. Thank you! This will be tomorrow’s dinner with a mess of cornbread! Thanks for posting! Thank you for posting a real black bean soup recipe. Of course the only real black bean soup is Cuban ;) Many Cubans use peppers called cachucha that add a distinct flavor but are not hot but I see where hot would be good. No cream, no cilantro, no cheese! 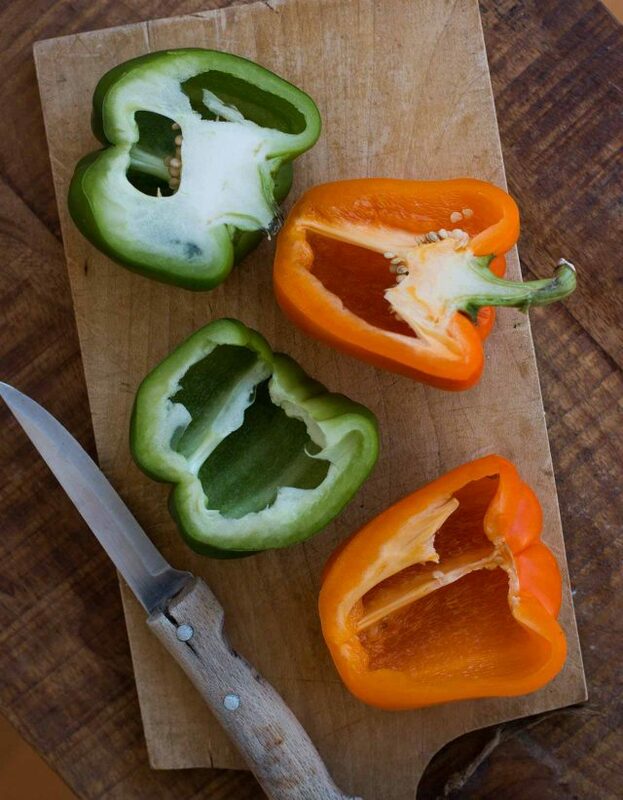 Bell pepper = green and other colour? Different flavour profiles (green tend to be grassy.) Love you blog David! Gosh, what an idea. What plant zone do you live in? Hi David, I read a really interesting article somewhere about our Paris water and the high levels of “calc” – and the effect on cooking dried beans. The antidote was to add baking soda to the water-which will, in effect, speed up the cooking and make the beans more tender. Alors! 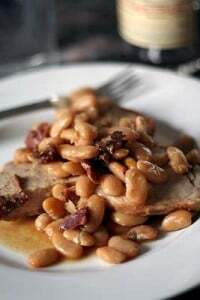 I tried it last weekend with pinto beans while making Texas style Charro Beans and Viola! It worked. I’m still experimenting with the science and will let you know the results if you are interested. Soaking beans has more behind it than “quicker cooking” (which doesn’t hold true to 2hrs on the stove vs soak time anyway). The first soak water should release toxins, so dump it. Similar to many seeds and legumes, if theory holds true, beans could also build up toxins in the care process. I’m sure it would depend on kind of bean, but many Mediterranean foods hold certain rules that could be of safer food use. I’ve never been able to find the science behind whether to keep or throw the soaking liquid for beans or nuts. The way I understand it, soaking doesn’t leach out the phytates, but activates the enzyme phytase, that neutralizes it. In that case it could be beneficial to keep it in. Can anyone enlighten me? Merci! Truly not being scientific about this (too colloquial for that) but my Aunt and my mother, two fantastic cooks who listened to older generations of cooking mentors, live by these soak rules. Winter cooks are the best mentors for any naturally preserved food use. As I understand my cooking mentors, they do a lot with beans & legumes that have to do with digestion and gas. Good and bad enzymes. Maybe good to listen to, considering all the intestinal and stomach issues our non-war, eat meat generation is now facing. I don’t think I had ever heard of black bean soup, though I love this type of beans. I will definitely give this one a go, it looks delicious! I made a good black bean and steak soup last week, but was a bit too enthusiastic with the Hatch chilies, so it had a lot of heat. I’ll try yours next. I only use Rancho Gordo beans, I’m just spoiled I guess. I cook them in the IP and the old fashioned way. Sometimes I soak sometimes I don’t. When I am cook them in the IP I just throw everything in and cook them for 25 minutes. I’ve had nothing but good results. You don’t get the same nice bean broth in the IP that you do when you slow cook them, but if you give it a couple quick pulses (I’m talking seconds only) with an immersion blender, it thickens up beautifully. Rancho Gordo beans are the BEST! Not always easy to find where I live but way better quality than grocery store brands. We roast and peel our green (bell) peppers before putting them into black bean soup (or any dish) because many people (I am one such) find the skins difficult to digest. Roasting the otherwise bland bells adds a pleasing flavor element to the soup, too. I was born in Cuba, came to the US in 1960 and grew up tasting the wonderful black beans that my French-born grandmother prepared for special holidays. I’d like to comment that we did not use jalapeños and did not use the garnishments mentioned that are so prevalent in the Latin cuisine of today. I’d like to add a couple ingredients to your recipe that my Grandmother considered essential: a tad of cider vinegar and a pinch of sugar, to be adjusted to your taste as you would the salt. Love your books and blog! Bonne chance! This is just like my aunt’s recipe. Thank you, Nora. I’ve never had a spicy (from chilis) Cuban black Bean Soup. I’m Cuban-American (1st generation US born) and I concur with the vinegar and sugar. It also seems odd to just have the soup and not mix it with rice or serve it with meat–for a Cuban meal it would not just be the soup. My personal favorite way to eat frijoles negros is with rice, a fried egg, and a banana! Hi David, I’ve found good black beans at African grocery stores in the 11th arrondissement, notably 166 rue Saint Maur. While this may be a tasty soup, it’s not authentic to Cuban black beans. Indeed, no authentic pre-revolution Cuban recipe uses any pepper other than bell (perhaps modern Cuban cuisine does). One also does not use either olives or oregano in black beans – and definitely no cilantro. I am a second-generation Cuban-American married to a Cuban, and no one on either side of the family uses any of these ingredients in Cuban recipes. I will agree with commenter Nora that vinegar and sugar are often used to finish the recipe. 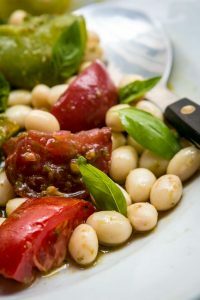 I can also say that, to make any bean recipe easier, make them in a slow cooker. As long as you start them by 10AM, they should be ready by dinner. No soaking necessary, and no need to throw away the tasty cooking water. I don’t know the difference between pre- and post-revolution recipes but most that I see (in Spanish on Cuban websites) call for “1 pimiento verde mediano, picado” and this one which calls for “1 ají pimiento grande, verde, rojo o pintón,” so perhaps the recipe has changed or evolved. (Recipes change over time, though; originally Thai cuisine didn’t use chiles either. Now they’re synonymous with many Thai dishes.) If you make it, you can certainly omit the cilantro. Mr. Libowitz, the difference between pre and post revolution Cuba is the fact that Cuba became a communist nation circa 1959 and it forever changed everything including its cuisine. Food was extremely rationed and ingredients were at best scarce. Thus, it became impossible to cook with classic recipes. Hi David – just want to check – the recipe says 9 cups (1.15 l) water. Shouldn’t 9 cups be more like 2.15 liters? Will save this recipe and try it soon! Hello David Black beans are an important part of Venezuelan diet so I cook them quite often in an instant pot for about 30 minutes after it boils (about half the package). I use the same black beans the chinese use in their sweets and it works really well. In Venezuela we don’t use bell peppers for this soup but “Aji Dulce” that I can sometimes find in chinese or exotic stores as “piment végétarien” (funny name since all peppers are vegetarian haha) and we add some pork too, sometimes I use lardon fumé and it gives a nice taste. I think next time I’ll add vinegar, never tried it that way. I purchased all of the ingredients to make your recipe. It sounds very authentic and delicious. 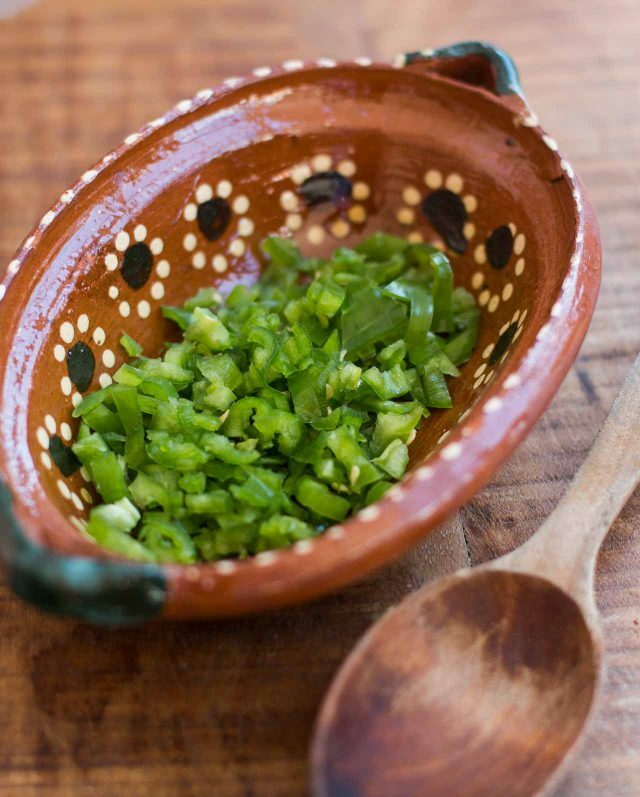 I lived in Mexico City for two years, and was fortunate enough to have a wonderful cook in our household. She used to make us her version of Mexican black beans topped with queso fresco, which she served along with Mexican rice, fresh homemade corn tortillas, and guacamole. She gave me her recipe, and I went to the market and purchased all of the ingredients, because I was sure that I could make beans just as delicious as she. Being a fairly new cook, I didn’t know that I had to pick through the beans very carefully to remove little stones. Umm…luckily, no one broke a tooth! It’s the small details that can derail us. Now as it happens,yesterday I awakened to the fact that I ‘d forgotten to soak my black beans before retiring for the nite. @#$% I muttered and then consulted The Great And Powerful Google for a remedy and discovered a very entertaining article by J Kenji Lopez from Serious Eats with his findings on soaked vs unsoaked.Sold me.Tried my soup without soaking the beans and it is perfect.Had to lengthen the cooking time 40 minutes-that’s it. David, As I started reading this my 1st thought was that I must steer you to Rancho Gordo. They have fantastic beans. And then when you said you don’t like green peppers I gave a nod to you. I absolutely,positively cannot stand green peppers. So, all that aside, thank you for the recipe. Black bean soup is a real treat and this sounds a notch above. Soaking the beans overnight, discard soaking water, cook beans in fresh water. This removes much of the gassiness from the beans. Deborah Madison has a wonderful black bean soup recipe in her big Vegetarian Cooking for Everyone that calls for Madeira and green bell peppers plus other vegetables. The Madeira gives it a fabulous flavor. cher David, I feel totally insecure unless I have a kilo of black beans visible in my kitchen (grew up in Latam), so “muchas gracias” for this–canned black bean soup is NOT the same. In NY my children were fed with black beans (Goya), plantains and rice. In the Cévennes, more difficult — plantains there are (Carrefour) but black beans and jalapeños more difficult. Your recipe is a gift ! Thank you. Deborah: I don’t think they have stores in the Cévennes, but they sell jalapeños at Marks & Spencer food stores in Paris. You can stock up…and perhaps pickle some to preserve! Maria: Most packages of beans and many grains advise sorting them for debris. So it’s always a good idea. I bought some wheat berries and recently and found a number of tiny stones in them as well. Kathryna: Yes, I’ve seen those ‘vegetarian peppers’ in Paris, too. I was curious about them (because, like you, I didn’t know there were non-vegetarian ones). But they are indeed a variety of peppers that are apparently used in the cuisine of the Antilles. Claudia: I’ve not seen any conclusive write-ups on why you should dump the bean water. The most comprehensive and trustworthy article I’ve read on that was by Russ Parsons, who spoke with several bean researchers from agricultural associations, and they found no reason to dump the water. I buy black beans at Auchan in Chatellerault. I don’t think they are particularly difficult to get here in the Touraine, but we have quite a large Portuguese population in the area. I was reading your latest book and came across Far aux cerises – we tasted far on a trip a few years ago and when we came home I found a recipe for the “traditional” far – love it but when I saw this and thought about the cherries I had in the freezer I immediately made one. Love your horror of a recipe! There’s something missing in this line “1 teaspoon, plus 1 teaspoon salt”. The recipe uses 2 teaspoons of salt, total. Some recipe writers just say “2 teaspoons of salt” even if it’s divided, in this case (or some say “divided”) – but since they’re added at two different points in the recipe, I separated them out. I have just had 10 wonderful days in Paris, visiting my daughter who has spent 4 weeks staying at Les Récollets while taking part in a language course with other students from the University of Western Australia. Two of her friends are vegans, and I was able to introduce them to Ara Chocolat, thanks to you. And they are most grateful. We had a great visit to the store, mentioning your name as our inspiration! Happy you liked the chocolate shop! It’s a pretty special place and very nice, plus…they make chocolate. The number ‘4’ is use twice in the directions. Oh! What a magnificent addition olives are to soup. Such a simple thing to include, something I never would have thought of. I made my Italian sausage soup tonight and popped in some Sicilian black olives. Oh! Magnificamente delizioso. Thank you David! I have been a fan of yours for so long, have met you twice in Paris and am currently living in Bordeaux. For the love of animals, I am now vegan which you can imagine is so difficult in France. Thank you from the bottom of my heart for this recipe which I plan to make this weekend and probably every week for the rest of my life!! David I just finished reading l’appart and what a nightmare! I have had my dealings with bad contractors in the U.S. so I could feel a bit of your pain. I just wish you could have put a few pictures of the chaos, the plumbing mess and fix and the finished product. I will now have to spend some time catching up on reading your blog since I just found it because of your book. Thumbs up from Ohio. David, I noticed the cute All-Clad ramekins in your pizza beans post and ordered them recently. I love how heavy and well made they are. Do you know if you can use them on the stovetop? I’m also considering buying a set of All-Clad and trying to decide between the original Tri-Ply and d5. Do you have a preference? Thank you. Funny because the instant I saw this post I thought of my favorite recipe for black bean soup, and it also has olives in it. Perhaps a bit unexpected, but it’s so yummy. I’ll have to try your for comparison. I love d5, but when you start using the copper core, you will truly feel spoiled. I know many people (I think DL included) say they pop the cookware into the dishwasher, we never do, especially if you use a citrus based d/w detergent. Bartenders Friend. Brilliant recipe, Mr. Lebovitz. Many thanks. This recipe looks delicious but I’ve never had any success with dried beans (maybe they were old? ), so I’m going cheat and pick up a couple of cans of black beans at Thanksgiving on rue St Paul and follow the rest of your recipe to a T. Thanks! It’s difficult to find “fresh” dried black beans in Paris (I haven’t had much luck) and mine have always resisted getting soft, so I generally lug over a few packages of Rancho Gordo beans. Good luck with the canned beans and let us know how your soup turns out! Hi David, I discovered your website while looking for an authentic swiss fondue recipe and got hooked on your blog. I find your writing very interesting and educational. Living here in the Philippines, a small country in Asia, I read each comment in all your post because learning cultural differences amaze me..
We also have black beans but we cook it differently from yours, we boil it together with some beef short ribs and bay leaf, sauté garlic and onion, add the boiled bean soup, then season it with salt and pepper and it’s good..
Hello again… I just posted above, but just looked up the beans I found that are so delicious. They can be found at baer’s best beans on-line, and it appears they grow a variety of heirloom beans that can be ordered. I’m going to try a few of their other varieties. I soaked them all morning, then simmered for a few hours and they were just perfect. I made this exactly as printed in late January and the family loved it. Last week I defrosted the remainder of the soup and it was wonderful.